1. 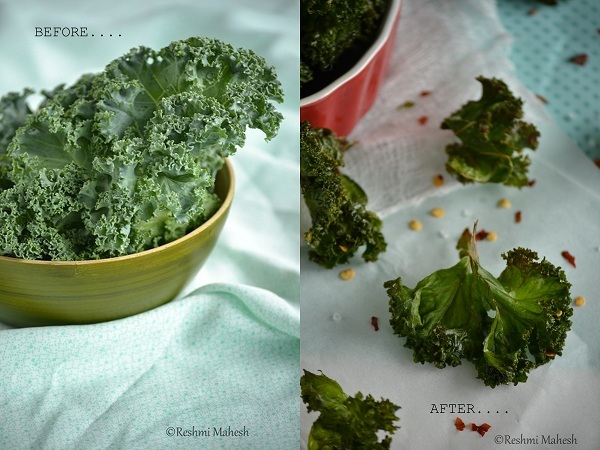 Wash the kale leaves and dry them thoroughly.Remove the thick veins and tear the leaves to bite sized pieces. 2. Drizzle the olive oil and sprinkle salt and chili flakes as needed. 3. Mix well and place on the baking sheet without crowding and overlaping them. 4. Place this into a pre-heated oven to 375 F. Bake for 15 minutes(turning the sides in between) or till brown(not burned) at the edges. 5. Serve as a snack or as side. 1. 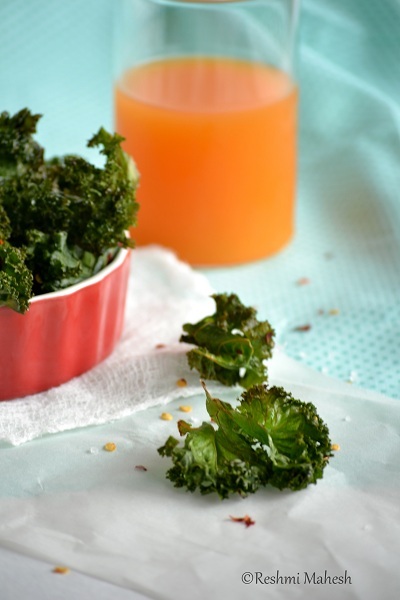 Adding more olive oil will result in greasy kale chips.Just add enough to coat the leaves sightly. 2. Season according to your taste. 3. Be sure to remove thick veins from leaves. lovely colour. we dont get it here but so want to make this. 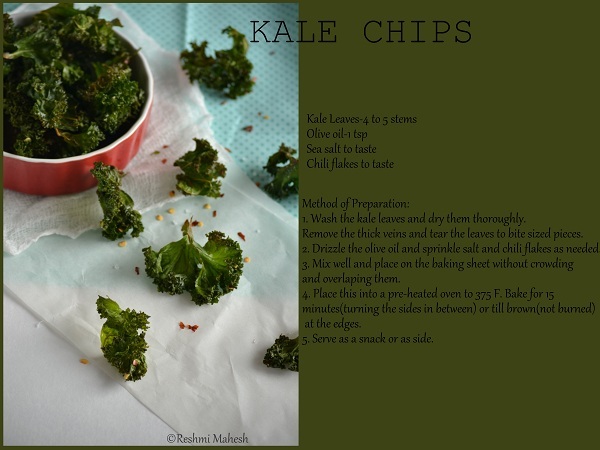 Delicious chips, I am afraid of its bitterness of Kale. Very interesting chips Reshmi. Crispy and looks irresistible. Want to try now. Bookmarked it. Interesting recipe..very healthy one too. 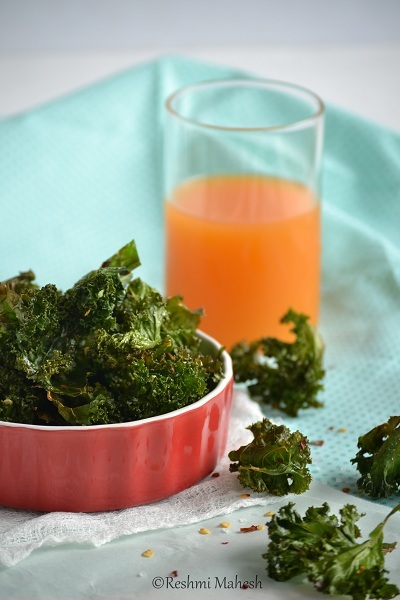 Baked Kale Chips are Da Bomb! Looks irresistible!!! This looks delish and too healthy!!! They looks gorgeous Reshmi..Love to grab few.Karishma of your clicks! Looks so Yummy..Will try this once.. 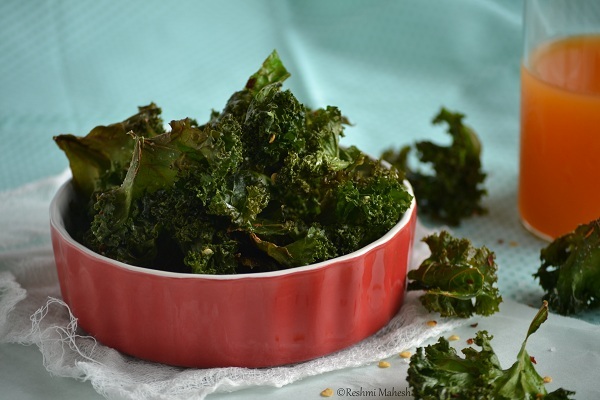 I have heard and seen this kale chips a lot, but no idea how it would taste. But sure looks tempting! 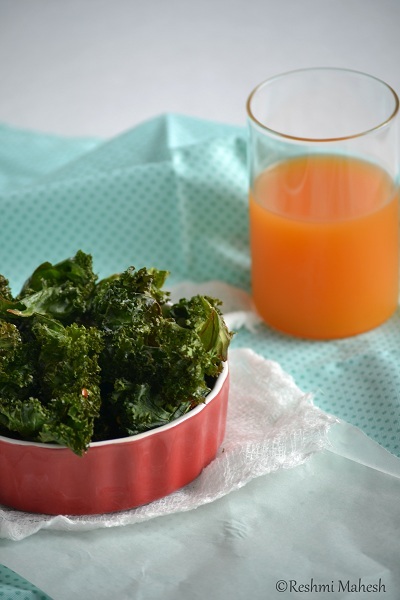 KAle chips looks crunchy and yummy..
New to me. looks gr8..
looks very tempting, baked once! very pretty clicks Reshmi! Amazing snaps and perfect for evening snacks. 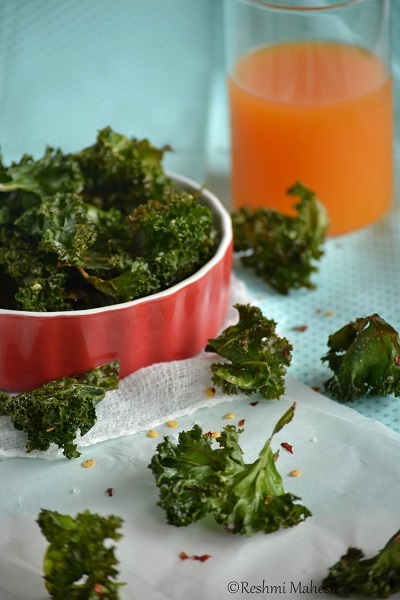 I love this guilt free kale chips. Fantastic and looks awesome, wish to munch some. 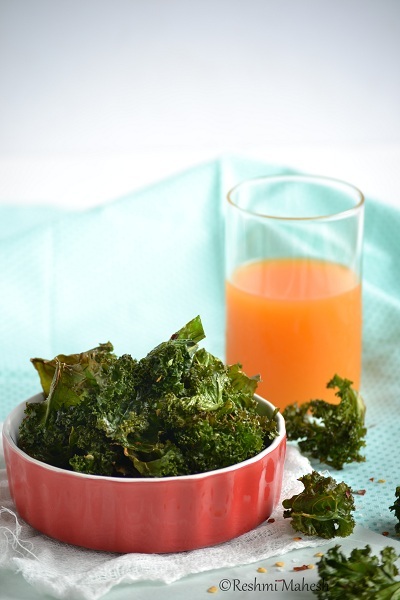 Love kale chips! So healthy to munch on!